The last book of the Xenogenesis series, Imago (1989), continues to examine the impact of governmental gene manipulations on humans. The humans who were not willing to mate with the Oankali aliens have gone to Mars—the new colony is 50 years old by now—and those who were willing to mate are still on Earth with the aliens. However, the Oankali have made several new discoveries, they have found a human colony that was still fertile and producing diseased children, and the Oankali have accidentally bred a human-construct ooloi. In Dawn, the Oankali made all the humans sterile before sending them back to Earth, so that they would not destroy a new generation of people. In Adulthood Rites, a compromise was made to allow humans to reproduce if they wanted to on Mars, but they would have to start their new life from scratch. In both books, we see “the human contradiction” at work, and in Imago we see the Oankali’s mistake. The Oankali believed that because “intelligence is relatively new to life on Earth” and “hierarchical tendencies are ancient…the new was often put at the service of the old.” The discovery of the diseased yet functioning breeding human colony created an alien contradiction. 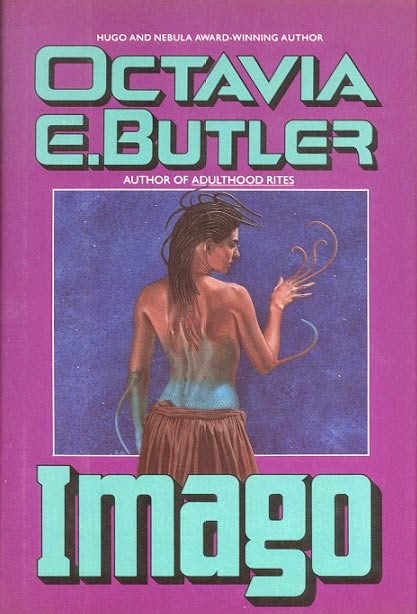 In Imago, Butler critiques the governmental system and its representatives, both human and alien to expose its flaws. All behavior is governed by a system, and whatever system trains us, that is what we trust regardless of how poorly we are treated. Butler constructs a world created to protect, then divides it to highlight that even if systems are put into place for help, there must be another system to govern the system in place.